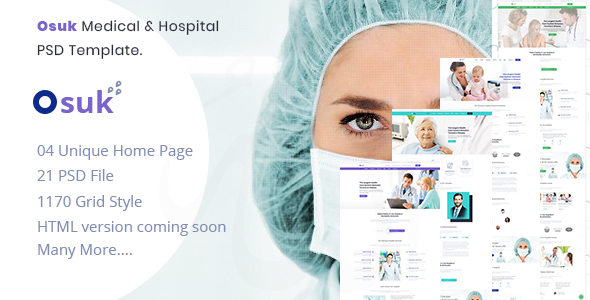 Osuk is a PSD Template suitable for medical, Hospital and health related projects or businesses. The Template is maintained in a minimalist and modern style with strong color accents. There are 04 different layouts just for homepage and a total of 21 page layouts including, services pages, about pages, team pages, departments pages, gallery, Learning, blog, Faq and Contact with different layouts together with single or more photos pages, contact pages and many more. This entry was posted in health-beauty, psd-templates, retail and tagged beauty, clean, clinic, corporate, dentist, doctor, fitness, health, hospital, medic, medical, medicine, psd, timetable, wellness by dadmin. Bookmark the permalink.